Ah yes, the much anticipated album of the year is finally out. 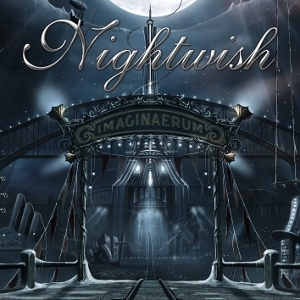 Nightwish releases their seventh studio album Imaginaerum, the same name by which the movie will be named after. Knowing this album is based around a movie, the music is going to be basically a film score with Nightwish playing over it. And of course as expected, the hype surrounding this album is so out of this world and many wonder if this will meet all the expectations. As mentioned on my Dark Passion Play review, I felt that their new vocalist Anette Olzon seemed out of place in the music and the range of the vocal melodies were too high in pitch for her. As of late, Anette hired a vocal coach to help with some of these issues she had from the previous album. Will it pay off? I really admire her courage and desire to improve. Of course, there will never be a vocalist like Tarja Turunen again in Nightwish. She was so unique and really brought out the essence and beauty of Tuomas’ music. Despite that, I am willing to accept Anette as their vocalist and see what she can offer on this album. With all of these expectations and hype, will Imaginaerum live up to it? Well let’s dive right into my song by song review of the new Nightwish album! 1. “Taikatalvi“: (4/5) The intro track. Starts off with a toy box playing a melody with Marco singing in Finnish. He sounds great as he usually does. I wish I knew Finnish though. I think the song gets very beautiful when the flute and the string instruments come in. A very good intro track. 2. “Storytime”: (4/5) The first single of the album. A very catchy and upbeat song with a very strong orchestral section in the middle. It also features a children‘s choir, one of the elements that is unique about this album. I will admit that this is a “safe” Nightwish song so to say with everything that you most likely will hear by this band, but it does a good job in representing the album as a whole. 3. “Ghost River”: (4/5) The song starts off with a great guitar riff. Reminds me of Van Halen, but this is of no surprise since Emppu plays in an 80’s throwback band (Brother Firetribe). Marco sounds very dark and cynical in the song, especially in the pre-chorus sections. The children’s choir singing part of the chorus was very nice. A very good song. 4. “Slow, Love, Slow”: (4.5/5) This is the most unique song Nightwish has ever composed. It is a jazz song. Yes, a jazz song made by Nightwish! Out of all the songs I heard with Anette singing in it, this has to be perhaps the best and most versatile vocal performance in her career with Nightwish. Her voice fits the mood of the song so well. I also love Emppu’s solo in this song as well. It is unorthodox for him to come up with such a bluesy solo, but it sounds so good and I rate this solo one of the best in his career with Nightwish. No other band in their genre would dare to reach these territories. Just brilliant. 5. “I Want My Tears Back”: (4/5) This song is a bit more structured, much like “Storytime” and could easily be another single from this album. The chorus is extremely epic and well written with Marco and Anette giving great vocal performances. The highlight of this song is Troy Donockley on uillean pipes. He gives this song such a great atmosphere and the folksy breakdown with him and Emppu dueling is fantastic. Very cool. A recommended listen. 6. “Scaretale”: (4.5/5) Symphonic power metal at it’s best. A very creepy intro I must say, but when it gets into the good parts, it takes off and never lets up! It’s very bombastic and a big sounding song. Also, Anette’s vocals are so powerful in this song. Here, she sounds dark and evil, something I never would have thought she would sound like. The middle part of the song is so crazy! It’s basically circus music! At first, I thought this was very odd, but the more I listened, the more I liked it and it is actually quite brilliant. One of the album’s highlights. 7. "Arabesque": (3.5/5) An instrumental. A very cool orchestration, but it isn’t the highlight of the album. It is worth listening to though for good atmosphere and feeling. It’s almost like intermission. 8. “Turn Loose The Mermaids”: (4/5) A folksy ballad with Celtic influences. At first I did not care for this song that much, but the more I listened, the more I liked it and realized that it is actually very good. I think Anette sounds very nice on this song too. Beats the hell out of "Eva" that’s for sure. 9. “Rest Calm”: (4/5) A slower metal track, but good nonetheless. Marco sounds so powerful and literally blows you out of your seat in this song during the verses! I like how they have Anette singing this one, going from one emotion to another during the chorus sections. Very clever. The children’s choir is also featured in this song. A very recommended song. 10. “The Crow, The Owl, And The Dove”: (3.5/5) Honestly, I really disliked this song when I first heard it, but like “Turn Loose The Mermaids”, the more I listened the more it grew on me. The only thing is that this is probably the most radio friendly song Nightwish ever released. Despite that, this is actually a well written song. One thing I didn’t care for is the breakdown where Troy Donockley sings. Yes, the pipist sings! It sounds out of place, but it doesn’t destroy the song. Not my favorite song on the album, but it is worth a good listen for sure! 11. “Last Ride Of The Day”: (5/5) Epic!! That is exactly what this song is! A very good bombastic song with a whirlwind of emotions and feelings throughout. The highlight of the song is the chorus. In my opinion, it's one of the best choruses in Nightwish’s career. A great melody! The orchestra and choir is used so well in this song. The best song on the album for me. Just pure Nightwish. 12. “Song Of Myself”: (2.5/5) A very long song, clocking in at almost 14 minutes. Great orchestra sections, choirs throughout… etc. Why is this song only a 2.5/5? Well because it is only half of a song! The first half sounds very powerful and good. The second half of the song is basically dialogue! What?? Really? Yes, we have six and half minutes of basically strings, piano, some guitar, and people reading dialogue from what appears to be a script from the movie I assume. I don’t know. All I know is that it was unnecessary to have for that long and because of that the song is a big letdown. A little bit would have been okay, but I think that part of the song should have been a separate track in my opinion. But it is worth a listen if you like poetic script reading and if you pay attention, there is some interesting stuff being read actually if you have enough attention span to get through it all. 13. “Imaginaerum”: (3.5/5) Another instrumental and the title track. Seems to be the music you would hear at the end of the movie during the credits. It is basically the orchestra, led by Pip Williams, playing the highlights from every song on the album. This track sounds very nice, but it isn’t my favorite one and I think it is one of the weaker tracks. Much better album overall than Dark Passion Play, with better lyrics and better songs throughout. Anette’s vocals are vastly improved, mainly due to the fact that the songs are now written for her range. Marco sounds so epic and great as usual. Very epic orchestral sections throughout. So much variety and experimentation. Lack of good guitar work at times, but when needed, Emppu has good stuff on here. Parts of the album has flaws, like Troy singing in “The Crow, The Owl, And The Dove” and the second half of “Song of Myself” for example. Some listeners may have to listen to it a few times to get the idea of the album. I feel that Nightwish has really stepped up on this album. I am so impressed with how they made a great comeback since the last album. Dark Passion Play seemed very awkward and not like a true Nightwish album the way I know them. All the mistakes that were on Dark Passion Play are corrected on this album. If you are a fan of the last two albums, you may have a difficult time accepting this album at first because of it’s theatrics and experimentation. The last couple of Nightwish albums were definitely more commercial sounding compared to this one. Imaginaerum goes back to their roots with the lyrics and songwriting aspects, while at the same time incorporating elements from the last two albums. There are literally so many crazy things going on in this album, and you really do need to listen to it a couple of times to get it all. If you listen to the album from beginning to end, it actually makes more sense. As far as Anette goes, I am impressed with her on this album. Her vocals have improved so much and I can tell she is really trying to get better. As I said in the last review, I had nothing against her as a person, but I felt that she did not belong in a band like Nightwish. But after listening to this, I can say that she actually belongs now with all the diversity that this band can bring to the table. Think about it, she sings in a jazz song, a folk song, and a bunch of epic symphonic power metal songs. As much as I miss Tarja in Nightwish like most of us do, you have to admit that she did a pretty good job and I don‘t think Tarja can sing some of these songs as well as her either. Sure some people may not like her sound vocally and she isn‘t the most unique singer ever, but I think that if you still have issues with Anette, keep an open mind because you will be very surprised with what is offered on this album. This kind of diversity of music is not something many bands can achieve, which is why Nightwish is one of the greatest bands of all time to me. This is why they are legends and should be accounted as being perhaps the best band of our generation. Tuomas knows how to impress people, and I can honestly say that he has done it again! It is an exciting time to be a Finnish metal fan. The music that comes out of that country is so great and this is another album to add to your collection if you like symphonic power metal or female fronted metal. It is by far their most consistent album since Wishmaster. It has its flaws of course, but the good outweigh the bad and remember to keep an open mind when listening to this. I give this album a horns up as I can honestly say that the true new era of Nightwish starts now! \m/ Congratulations Nightwish on a job well done! I can't agree with the improved vocals bit, woman sounds like a banshee in places. I also feel like this is lyrically stunted from what I've heard (as another critic put it: a teeny horror/goth nightmare or something- not my words! ), but I don't have the lyrics booklet either. Those things are pretty subjective of course. As a former jazz player, I think "Slow, Love, Slow" is very unremarkable and lacking energy. She's lacks the depth and natural huskiness that makes jazz ballads so good, I suppose. I really enjoy "I Want My Tears Back", and "Scaretale" is good, and the closest thing they've done to power metal in a while. Pipes are great, last instrumental is great too, but there's not enough for me to get into. Symphonic atmosphere is good, but they're no closer to waking up the bass, drums, and guitar (although "Ghost River" ACTUALLY has a cool lead) than they were on Dark Passion Play. Thanks for the comment, Protagonist. Yeah, I know there will be mixed reactions to this album. It all depends on how one looks at this. It is a very complex, varied, and deep album to decipher. I myself am not the biggest Anette fan, but she doesn't grate me either. I think she sounds very good on the album though and Tuomas knows how to make vocals work for their ranges. This album is proof of that. Thanks again! Well this album is fantastic, but is not just a other nightwish album, is a soundtrack too, for that reason is not easy to eat or hear, but have that nightwish moments like last ride of the day. and I disagree with you opinion of Song of myself, for me is the most epic nighwtish song, the people want another poet and the pendulum or another ghost love score,10 min of epic song but that will never happen again, cuz Tuomas dont make the same songs again, that was unique and stay unique, so many bands of symphonic metal make this song and dont happen nothing is not that epic cuz is a song of 10 mins of a kind of formula. and song of myself born in other place, the "poem" in the half part was a Walt Whitman moment EPIC!! if you can understand the recitation is damn pure sadness melancholic moment, for me was perfect. and I think this album dont have that commercial thing that they had in once and dark passion play for sure. Thank you for the complement! About "Song of Myself".. I like that you gave a different interpretation of how to approach the song. The "poem" part is actually quite good, but I just thought it was too long. But that is just me! Thanks for the feedback! Canuck, I look forward to your review of this album! Can't wait! Great review! I was too lazy to do track-by-track after reading yours! Well, I pretty agree with most of what you wrote. Now you know my opinion as well.